Instructions: Create a 6 x 6" card base using white paper. Cut a piece of paper from the Cherry Blossom Retreat Paper Collection 5 3/4 " x 5 3/4 " and adhere to the card base using Dries Clear Adhesive. Cut out swirl die from Daydreams Bridge Die from paper collection and using Darice Adhesive Foam Strips, adhere to the middle of card. Stamp the leaves using Tweet Cherry Blossoms Cling Stamp Set on the white paper with Ranger Archival Ink Pad - Leaf Green, cut out with the coordinating die, shade use with this same ink using Daubers. 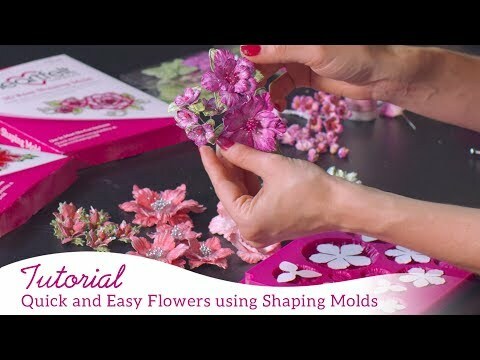 Shape leaves using Cherry Blossom Shaping Mold. Stamp birds, bridge from Tweet Cherry Blossoms Cling Stamp Set and Haven of Daydreams Cling Stamp Set and Ranger Archival Ink Pad - Sepia on the white paper and cut out with the coordinating die, shade with Ranger Archival Ink Pad - Leaf Green, Ranger Archival Ink Pad - Sepia, StazOn Ink Pad - Black Cherry, RACP454 Ranger Archival Ink Pad - Manganese Blue . Using sponges tap ready elements with Designer Dries Clear Adhesive and sprinkle Rajni Chawla's Crystal Clear Glitter.